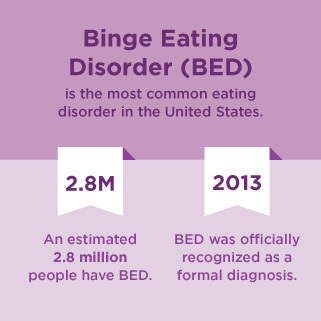 Binge eating disorder (BED) is actually the most common eating disorder in the United States. 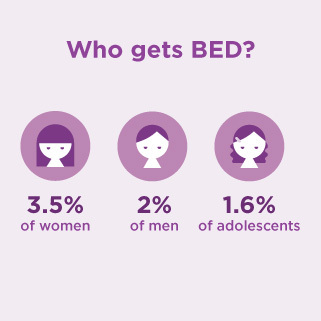 BED affects an estimated 2.8 million people in the United States, according to a national survey. People with BED consume excessive amounts of food in a single sitting. During periods of bingeing, they experience a sense of loss of control over their eating. They often experience feelings of guilt or shame following these binge eating episodes. Binge eating disorder affects three times the number of people diagnosed with anorexia and bulimia combined. Binge eating disorder is more common than breast cancer, HIV, and schizophrenia. Research shows that binge eating is associated with being overweight and obese. You can be obese and not have binge eating disorder, however. People with eating disorders often suffer in silence. This makes it difficult for researchers to identify the number of people affected by these disorders. 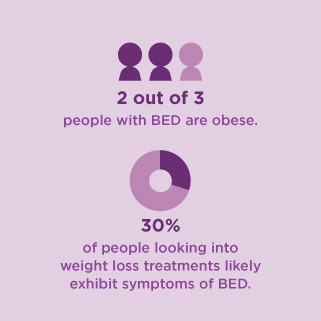 In one online survey, only 3 percent of adults in the United States who met criteria for binge eating disorder reported getting a BED diagnosis from their doctor. 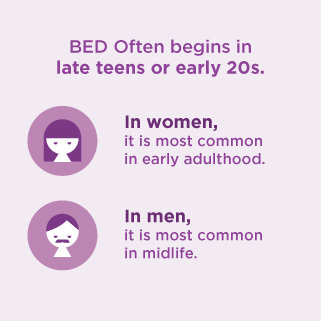 This suggests that many people with BED are not receiving medical treatment. 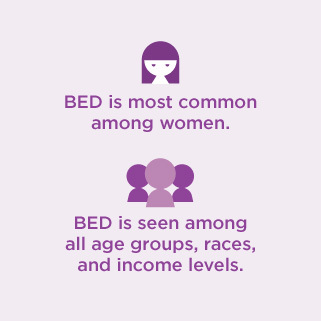 BED is seen among all age groups, races, and income levels, though it is most prevalent among women. It is, however, the most common eating disorder among men. 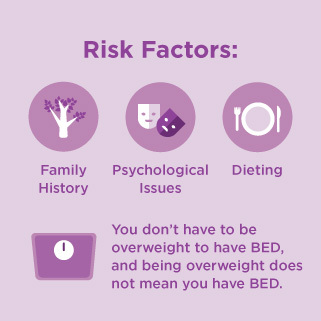 Weight is not a risk factor for BED in and of itself. People with binge eating disorder can be overweight, obese, or a healthy weight. If you have binge eating disorder, seek help now to avoid any potential health complications in the future. These could include both physical and emotional consequences. People with binge eating disorder can also suffer from anxiety, depression, low self-esteem, or other issues that can greatly affect quality of life. The good news is that treatment is available and recovery is possible. In 2013, binge eating disorder was officially adopted as a formal diagnosis in the American Psychiatric Association’s Diagnostic and Statistical Manual of Mental Disorders. Not only is there more awareness around the disorder, but there are also more doctors trained in the treatment of binge eating disorder. This has made it easier for people to receive treatment. Binge eating disorders can become debilitating and, in some instances, life-threatening. You should seek professional help if your eating habits are negatively impacting your quality of life or your overall happiness. The most effective treatments typically involve a combination of psychotherapy. Treatment may be done in a group setting, individually, or with a combination of the two. Particular attention will be paid to your medical and nutritional needs. You may be prescribed medication for depression in combination with cognitive behavioral therapy, for example. For some people, treatment can be done on a completely outpatient basis. For others, more intensive inpatient therapy at an eating disorders treatment facility might be recommended. Family-based treatment, which involves a person’s entire family in the treatment process, has shown some promise for children with binge eating disorder. No one should have to suffer alone. Reach out today if you or someone you know might be suffering from binge eating disorder. Treatment is available, and recovery can be just around the corner.